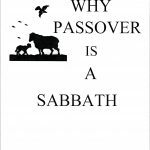 Few doubt the importance of the annual Passover observance. But while many proclaim its importance few actually observe the Passover at its appointed time. For example, Passover must be observed on the evening of the fourteenth of the first month (Ex. 12:18), but most all observe it on the evening of the thirteenth of the first month!